Depending on what you want to achieve, in terms of design for your house, combined with how it is currently sided - these will largely determine any new siding options. Also to consider, are any removal and installation efforts - some siding types can be fastened right atop others, such as by adding furring strips. Each type of siding has its pros and cons. These relate to time and labor for hanging the material, maintenance and finish requirements, including painting, and performance and longevity factors. Climate and weather; sun, snow, rain and wind will play a part as well. Vinyl Siding - offers strong installation advantages, and even, replacement advantages given that you have the extra pieces. Whether or not the spares are still being inventoried always store extras of any type. Also the integrated, holed soffit vent panels are an elegant solution and virtually undetectable - but over longer spans, these could exhibit sagging over time and might need re-attaching. Since typical vinyl is hollow, it flexes to some extent, and there exists the chance of wind noise passing through to the inner structure under certain installs. Easy to cut and fasten by linear tab, it is a standout for those undertaking DIY projects. A frequent complaint though is that pieces such as manufactured J-channels and similar may not be on the market when there comes a call for replacement, like for damage, cracking or wear. About the least expensive alternative for siding. Advances with the premium grades look more indistinguishable from wood grain textures and unlike 'plastic'. Metal: Aluminum/Steel Siding - have diminished in popularity for various reasons. Initially they offered the advantage of a pre-finished surface, but years afterward, these earned a reputation to result in chalking which resulted in the advent of thin vinyl coatings. The tougher steel has less chances of denting than aluminum, when pondering impacts, but both metals are rigid. Sound noise passes through the metal unless they have been installed over existing siding. The steel rusts. Their greatest advantage is that their core materials potentially last. Another major drawback - both metals conduct electricity and must be grounded by code in certain locales. Aluminum is the better option of the two for DIY'ers since it is softer and easier to cut, however this is a two-person operation. 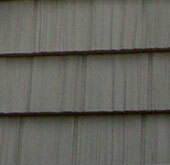 Shakes/Shingles - are an attractive choice, either individually or by the assembled panel (available in vinyl as well). Although cedar shakes and shingles aren't cheap, with their small convenient size, they are choicess for the do-it yourself project. Wood shakes can weather to a grey look, depending on if they are red cedar, known to elicit a brown tone, or white cedar. Rather unsightly, however, is the tannin staining that might bleed to the surface but which can be blocked with stains and sealers. Fiber Cement Siding - offers longevity and strength. Although it is held together by cellulose fibers, from which it derives its name, fiber cement by the same token is a harder siding to install, since it is prone to breakage. A heavier material, it does exert an increased load on the structural framing, and is fastened by pre-drilling. Fiber cement receives a paint finish. The solid siding covering the house can mean a minimal R-value advantage. An example is the James Hardie plank. Rated for up to 50 yrs for some premium grades by manufacturer. High costs to install, attributable to its hardness and weight. Wood Composition - such as those made of oriented strand board (OSB) or chipboard, have experienced a waning in popularity over recent years. Pressed and molded into an artificial woodgrain surface texture, they are factory primed. Weaker than other wood siding alternatives, these are likely to have shorter lifespans, higher maintenance/finish requirements and some have been the subject of premature failure by some brands. Wood & Clapboard Siding - depending on the wood species can last for 30 years or more, provided a proper installation and protective coatings at regular intervals. Typically clapboard or "lap siding" pieces are turned with custom knives, however. This makes the more standardized profiles appealing, since future replacement could mean custom runs at the mill. Painted or stained, clapboard forms a beautiful part of the outer home. Vertical panels, including T-111 panels - promote standardized installation. An unsuspected downside is that the dimensions that normally come in 4 X 8 sections, leave horizontal seams on taller areas. While other sidings, such as fiber cement panels, don't have this limitation and are available in 10 foot sections. All wood siding is combustible unless it has been treated. Vinyl in particular, has a reputation for coming off best, when it must be stripped. Stucco is among the most obstinate of removals, at the other end of the spectrum. Lastly, whenever siding is installed overtop other siding, the underlying layer should be inspected prior to the new layer for insects, verifying house wrap, the resulting levels being established, the possibility of settling, etc. There are several reasons to use the right house wrap atop the sheathing. Though there are exceptions, it helps to keep out water with improved vapor transmission rates, while offering other benefits. For how to do cut-outs on the window openings and install the material around doors and windows before any siding covers it.